Edith Grace Harman, age 95, of Seneca Rocks, WV passed away on Wednesday, February 7, 2018 at her residence. She was born July 15, 1922 in Onego, WV and was a daughter of the late Marvin J. Harper and Nanna Mae (Vance) Harper. 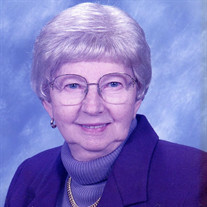 Mrs. Harman was a graduate of Circleville High School, attended Davis and Elkins and Shepherdstown Colleges. She taught school for several years in Pendleton County. She was a member of the Brethren Church, Onego, WV and attended the Seneca Rocks Presbyterian Church. On September 27, 1946 she married Mancil Harman who preceded her in death on August 11, 1992. She was also preceded by three brothers, Harlan Harper, Herbert Harper and Marvin Harper Jr. and two sisters, Jean Thompson and Ethel Lambert. Mrs. Harman is survived by one sister, Peggy Hedrick of Maysville, WV; brother-in-law, Calvin Thompson of Petersburg, WV; sister-in-law, Joy Harper of Seneca Rocks, WV and several nieces and nephews. Family will receive friends Saturday, February 10, 2018 from 6:00 - 8:00 p.m. at the Schaeffer Funeral Home in Petersburg. Funeral service will be held at 1:00 p.m. Sunday, February 11, 2018 at the Schaeffer Funeral Home with Pastor Fletcher Hutcheson, Jr. officiating. Interment will be in North Fork Memorial Cemetery, Riverton, WV. Memorial donations may be made to Living Hope Baptist Church, 1 Veach Avenue, Petersburg, WV 26847 or Charity of Choice.